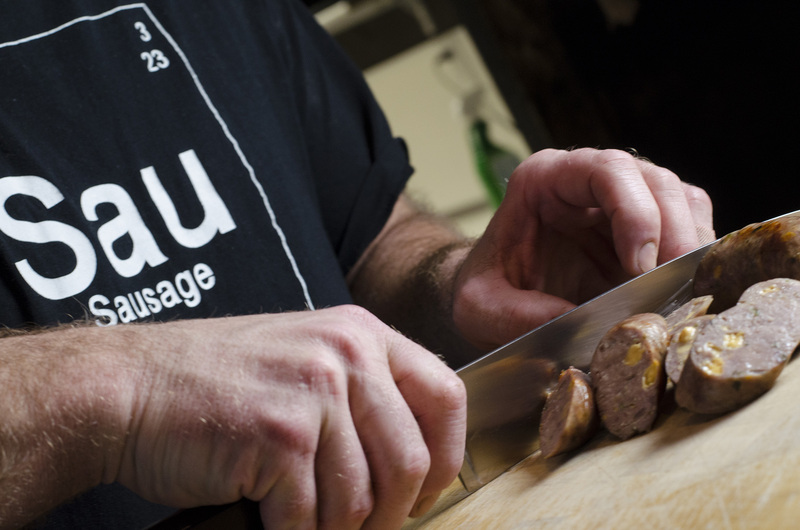 Learn to be a sausage maker with one of Canada’s best. As part of our Be A Maker Series, join renowned sausage maker, Robbie Bornais of Robbie’s Gourmet Sausage Company, in an evening of learning and eating. The Be A Sausage Maker is a hands on approach to learning the art and craft of sausage making taught by Windsor’s only national award winning sausage maker. It’ll be an evening of learning, eating and fun. In the class, you will learn the scientific principles that go into making sausages. From choosing your preferred meat, to binding, preparing your casings and figuring out the perfect ratio of spices. You will mix, stuff and tie your own links under Robbie’s guidance. At the end of the class you will be able to take home the sausages you made to share with your family and friends. A complete step-by-step write up of all the techniques discussed, as well as as a master sausage recipe, will also be included. Be A Sausage Maker will run every Monday at 7:00pm in January. It will be an intimate experience with a maximum capacity of 12 people. The class includes one drink and some prepared sausages to enjoy over the course of the two hour session. Cost is $85 per person and tickets can be purchased online.